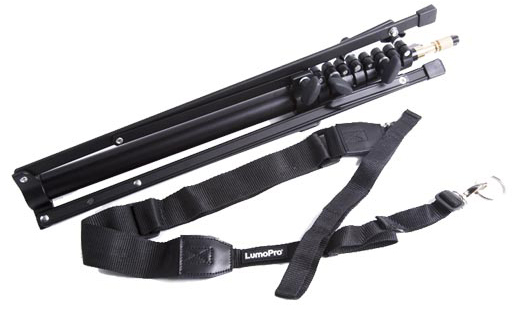 The new LumoPro LP605S features ground spikes and a carrying strap. The new LP735 Compact Umbrella is a 43-inch reversible lighting brolly. American photographic supplier LumoPro has announced two new accessories: the LP605S compact stand with carrying strap and the LP735 3-in-1 lighting umbrella. The LP605S light stand can reach 7.5 feet (2.3 metres) tall and adds to the design of the LP605, a folding stand with ground spikes. The new model also features a carrying strap, which attaches to the base of the stand with a carabiner. You can quickly release the strap from the top of the stand with a hook-and-loop ‘system belt’. Deskins commented: “In this case, we took one of the most portable stands in the world, and made it more portable.” The LP605S will not replace the LP605: both will be available at once, retailing at $44.99 and $39.99 respectively. 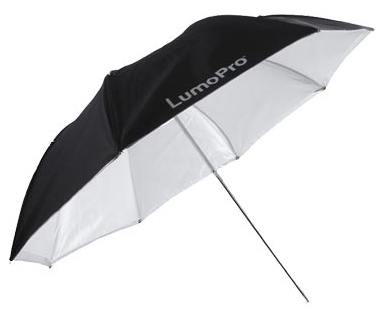 LumoPro also brought out the LP735 3-in-1 43-inch (109cm) compact umbrella, which can be used as a white shoot-through, a white reflector or silver reflector brolly, thanks to a reversible, removable cover. According to the company, this product release “marks the first time an affordable solution has been created for all three popular umbrella types”. The LP735 will retail at $29.99 in the USA. Both products will be available from Midwest Photo Exchange (MPEX) in the USA and CameraTools in the Netherlands/Europe. For more technical information, visit lumopro.com.